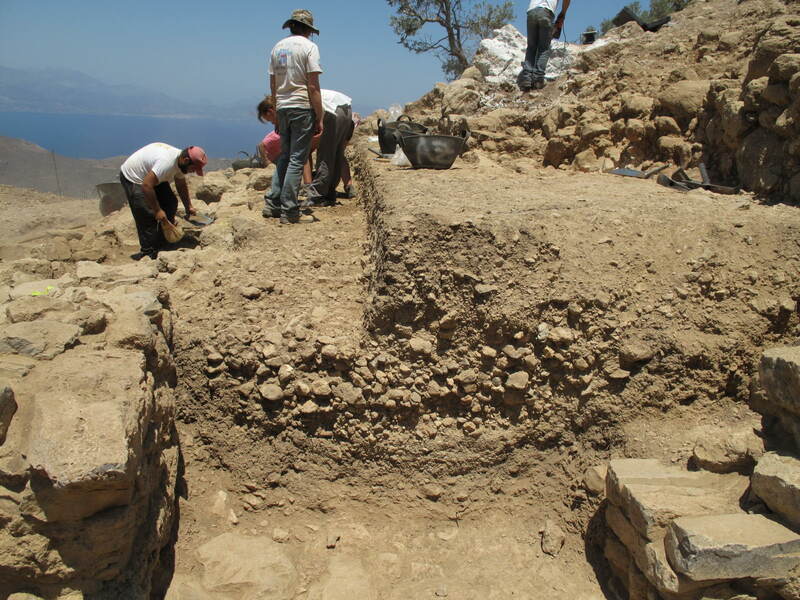 Fieldwork was conducted at the site of Azoria in northeastern Crete (Kavousi, Ierapetra), for eight weeks, including preparation (May 20-June 2); full-scale excavation (June 3-July 12); and one week to close down trenches and complete on-site documentation (July 15-July 19). The excavation period was followed by three-weeks of finds processing, study, conservation, and reporting (July 20-August 10). The project is sponsored by the University of North Carolina at Chapel Hill (UNC), Department of Classics, and conducted under the auspices of the American School of Classical Studies at Athens, by permission of the 24th Ephorate of Prehistoric and Classical Antiquities, and with the support of the Institute for Aegean Prehistory Study Center for East Crete (INSTAP-SCEC). The organizations and institutions providing partial funding, technical and consultant support, and student participants were the UNC Research Laboratories of Archaeology; UNC Curriculum in Archaeology; Duke-UNC Field School in Classical Archaeology (Duke Global Education); Duke-UNC Consortium for Classical and Mediterranean Archaeology; Duke University, Department of Classical Studies; Iowa State University, Program in Classical Studies; and the Azoria Project Volunteer Program (UNC-CH). The 2013 field staff consisted of the director (Haggis); field director and pottery specialist (Mook); assistant director (Eaby); palaeoethnobotanist (Scarry); zooarchaeologist (Dibble); architect (Fitzsimons); stone tool specialist (Tsoraki); registrar (Martini); excavation foreman (Kasotakis); pottery shed manager (Galligan); archaeobotanist assistant (Stevens Nelson); illustrator (Skivalida); Duke-UNC field school director (Antonaccio); and student manager (Clark). The representative of the Greek Archaeological Service (24th Ephoreia of Prehistoric and Classical Antiquities) was Ester Pothoulaki. (Complete staff list appended below). There were nine trench supervisors (trenchmasters; TM), from UNC, Department of Classics (Beeby, Benson, Buckingham, Hilker, Judson, Cabaniss, Juhasz); Duke University (Shea), and University of Sydney (Mann); 37 student trench assistants from various universities (USA, Canada, Australia, New Zealand, UK); 16 local workmen from the villages of Kavousi and Pacheia Ammos; four local pottery washers from Kavousi; and two senior excavators (Drs. Florence Gaignerot Driessen (Sorbonne-Paris IV) and Simon Jusseret (UCL Louvain)). Surveying was conducted by Doug Faulman (INSTAP-SCEC) and on-site conservation was directed by Stephania Chlouveraki (INSTAP-SCEC). Object conservation was conducted by Chlouveraki and Matina Tzari (INSTAP-SCEC). Administrative support was provided by Eleanor Huffman (INSTAP-SCEC). Funding was provided by grants from the National Endowment for the Humanities; National Geographic Society; Wenner-Gren Foundation for Anthropological Research; Institute for Aegean Prehistory; Gladys Krieble Delmas Foundation; UNC Department of Classics, College of Arts and Sciences; Vice Chancellor for Research; the Azoria Project Fund (UNC Department of Classics); Cassas Professorship research fund (UNC Department of Classics); and field schools of Iowa State University and the Duke-UNC Field School in Classical Archaeology (Duke UNC Consortium for Mediterranean and Classical Archaeology). 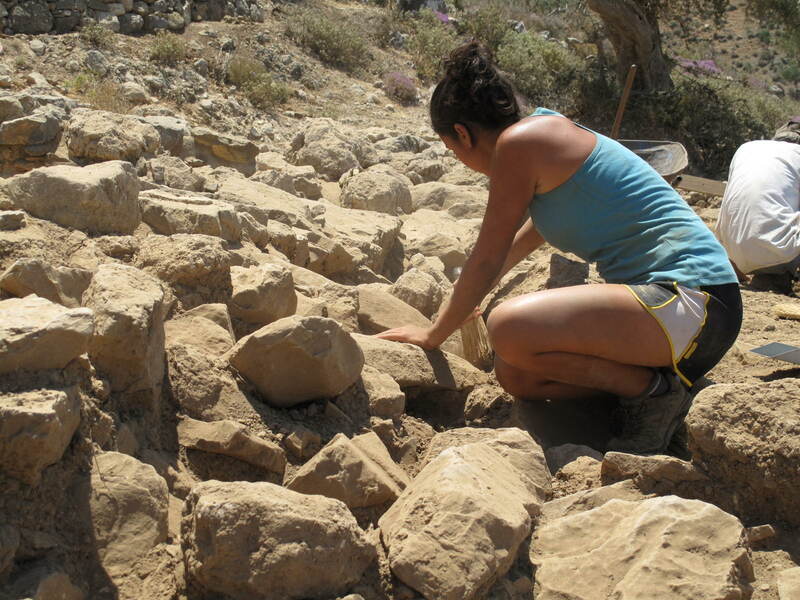 A significant cost-sharing contribution (in kind) was made by the Institute for Aegean Prehistory Study Center for East Crete (INSTAP-SCEC) in the form of conservation and photography services; excavation equipment; and consumable supplies. The purpose of work in 2013 was (1) to conduct a series of stratigraphic soundings beneath Late Archaic destruction levels (surfaces, floors, exterior spaces) that had been exposed in 2002-2006. The aim was to investigate earlier occupation phases; to understand stratigraphically the transition from the Early Iron Age to Archaic periods; and to refine the dating of the Archaic phases, in particular, a site-wide episode of rebuilding, renovation and alteration of the topography, involving the construction of communal buildings. In some cases these stratigraphic trenches cut through surviving Late Archaic occupation levels (e.g. A600S; B3900), while in others, the Late Archaic-phase surface had not survived, leaving exposed floor packing or foundation fill (e.g., B800; B3500; A2800). 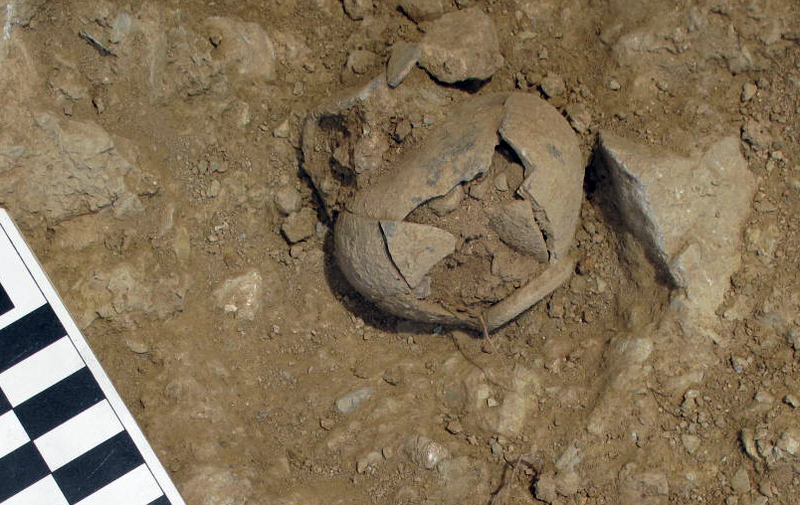 One target of excavation was within Archaic cobble fill deposits (A2800; B800; B4000; B3500). The existence of this fill layer, a distinctive stratigraphic marker of the Archaic rebuilding of the site, presented an opportunity to explore methods of construction, the date of the foundations of Archaic buildings, and the disposition and treatment of EIA-Early Orientalizing remains at the time of the construction of the Archaic settlement. 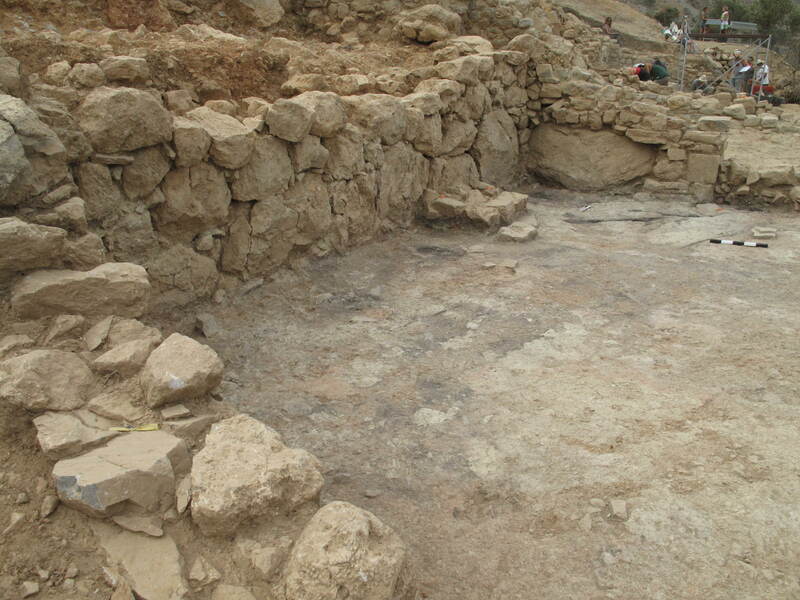 (2) To excavate the Early Iron Age-Orientalizing Building (EIA-O Building; B3900/B3000), the south room of which had been exposed in 2006. This structure consists of four rooms lying directly north of B3000 and B3900 (B4000; B4100; B4400). (3) To complete the excavation of the Northwest Building, opening trenches both north and south of D700 (D1500 and D1600). (4) To remove the baulk running along the west side of the main rooms of the Service Building (B4200), in order to understand the access to those rooms, and the form of a street or corridor along this terrace. 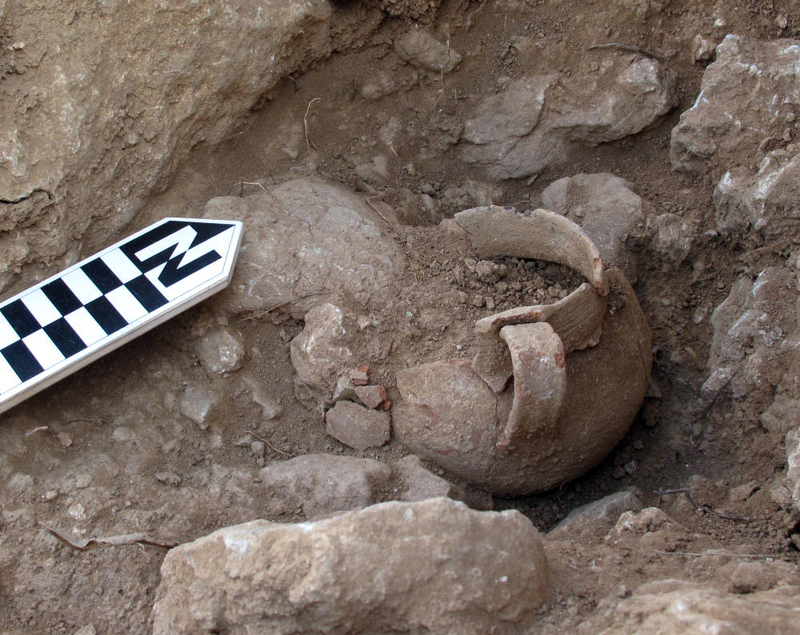 The western baulks of B3200 and B3400 were also excavated in 2013. Work in A600S—sondage within the south kitchen of the Communal Dining Building (CDB)—was conducted to investigate a row of boulder sized stones (A658), appearing in a line, running north-south across the east side of the Archaic room as exposed in 2002. The Archaic walls seem to rest on top of this wall in the north and south—the assumption was that this is the east wall of an earlier (Early Iron Age or 7th century) building extending across A600S and possible under the Archaic surface of A600N. The excavation was not definitive, and requires further excavation. Since the western limits of the trench consisted of modern terrace fill and our excavation dump, we were restricted to an area of about 6.7 square meters —2.30 wide (east-west) and 2.90 long (north-south). Removal of the Archaic surface and floor packing (A656) clarified the early wall, which appears to have two possible faces, but was badly disturbed by the later Archaic building and use of the space—the east face consists of the row of six boulders, visible before excavation, and the west a row of smaller stones. A possible return spur wall of two boulders (A659) was revealed on the south side of the trench, with a possible stone-built feature (bench or platform), A660, in the corner formed by the walls. None of the walls or features is well preserved, and the Archaic walls to the north and south appear to be bedded below the level of the putative Archaic floor surface, though the entire west slope at this juncture is tipped, sloping from east to west with the slope, suggesting that the Archaic walls may have slipped and sunk slightly on the west. Under the floor packing (A656), an earlier surface was revealed at the bottom of the A657, a layer of silt, cobbles and some wall stones, not inconsistent with occupation debris. The pottery from pails 1, 2 and 4 included Late Archaic sherds, though these were located at the far western edge and southwestern corner of the trench, likely contaminated by material from the Archaic surface, eroding with the slope. The material from pail 3 (A657.3) was recovered directly from the consolidated surface in the center of the space—this pottery is LM IIIC, EIA, LG, and 7th century, suggesting a layer of 7th c. occupation, with debris of earlier phases. 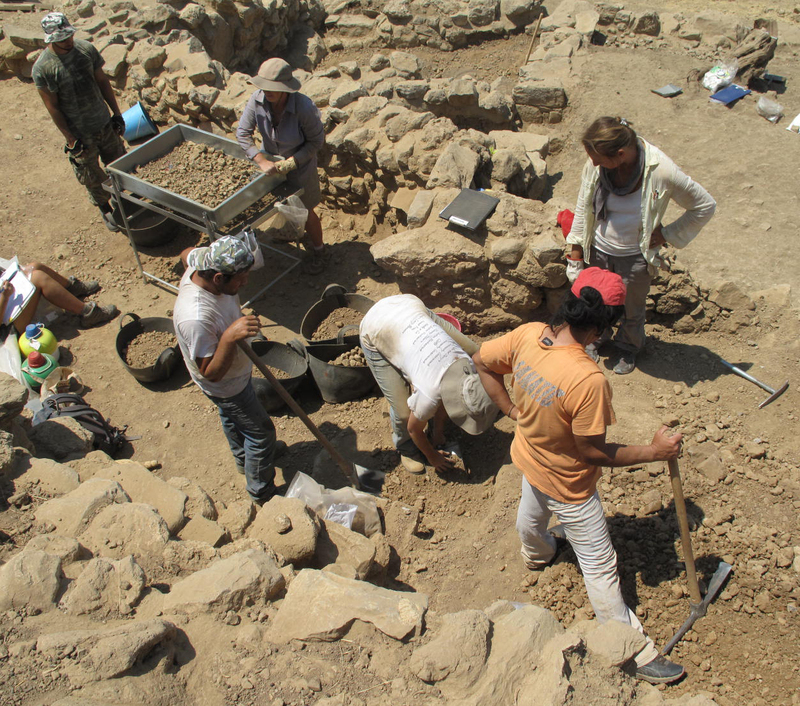 Further excavation is needed in this space to clarify the architecture and occupation levels. 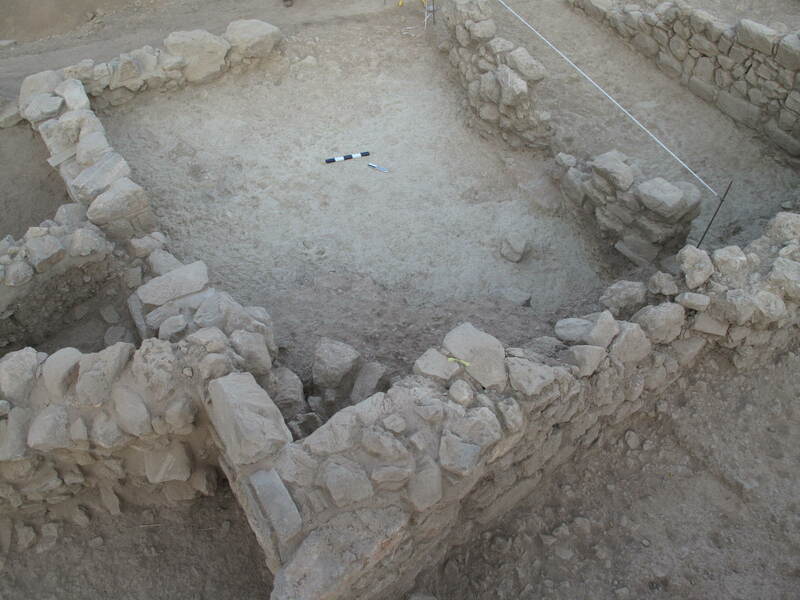 We are hesitant to call this a 7th c. building, as often LM IIIC foundations are preserved, with fill containing a range of dates from LM IIIC to Early Orientalizing. Immediately below the Communal Dining Building (CDB), southwest of A600S, and west of A2700, we excavated a test trench, A2800 (6.30 m x c. 8.0 m). This trench was opened initially as a test in order to confirm the absence of architecture or cultural in-situ material, so that we might expand our dump to the south—that is to say, previous excavation in adjacent areas of A2500 and A2600 revealed no in-situ cultural material, and the modern terrace seems to have been an agricultural field that had been repeatedly cleared and deep ploughed. One possible segment of a spine wall had been recovered on the northeast side of A2600, but no occupation surfaces or structures were found west or south of it. In 2013, A2800 was opened north of A2600, southwest of A2700, and immediately west of A1900S, which is the stepped entrance to the upper terrace of the Communal Dining Building. Excavation revealed two parallel walls, running north-south with the contour, spaced almost exactly 3.80 m, and forming a terrace containing dense cobble and small boulder fill. The lower westernmost wall (A2803) is exposed to a length of 7.20 m, while the eastern wall (A2806), lying up slope was exposed for a distance of 4.30 m.
While no occupation surfaces were preserved between the walls, they represent the foundations of parallel spine walls running along the terrace below the Communal Dinning Building, defining its western limits, and forming the architectural armature for buildings along the terrace below. The appearance of these walls was not anticipated, as excavation in D600, to the north of our dump, west and below A1400, revealed the partially preserved LM IIIC bench sanctuary, with no coherent Archaic structures or stratigraphy on top of it; and trenches adjacent to A2800 (A2500 and A2600) to the south, as mentioned above, were extremely eroded, producing no in-situ remains at all. The uppermost (east) wall, A2806, is bedded on bedrock, boulders, and cobble fill, some 2.5 m lower than the presumed Archaic occupation level of the western rooms of the CDB, indicating both the western limits of the rooms on the lower terrace of the CDB, as well as the ambitious scale of slope modification on this slope. It appears as if the western edges of the rooms of the lower terrace of the CDB (A1400, A1600, A600, A2700, and A1900S), were supported by a two-meter deep leveling fill, filling in the sloping bedrock terrain. This is also to say that the western spine wall of the lower terrace of the CDB (A2806) would have been minimally 5.0 meters in height. The east wall is composed of large to medium sized boulders, preserved to two to four courses (1.30 m in height) along the exposed length. The west wall (A2803) seems to make use of smaller boulders, though some large stones are present. A sounding in the southwest corner against the east face of the wall, exposed large cobble and small boulder fill up to its top extant course. While the occupation surface between these walls does not survive, by using the bottom extant course of the eastern wall as a likely elevation of the Archaic floor level (ca. 362 masl), we can reconstruct a depth of 1.5 meters of boulder and cobble fill supporting the buildings on this terrace. Material recovered from the sondage inside the east face of the western wall (A2807) was a mixture of EIA-O material. The latest ad quem/post quem date for the Archaic fill is late 7th century. Work in B800 was an expansion of a sondage excavated on the east side of wall B804, which effectively bisects the trench north-south. The area of the original sondage of 2006 was expanded to the south, in order to increase the sample of pottery from the Archaic cobble fill deposit, and to clarify the function of wall B804, which we had thought was likely to be LM IIIC, based on the results of our earlier sounding—the LM IIIC material recovered from beneath the cobble fill layer on a consolidated surface at the base of the wall on the east side. Expansion of this sondage in 2013 revealed more cobble fill (B857), with the expected range in dates from LM IIIC to the 7th century; the cobble layer covered a small area of consolidated clay at the base of the east side of the wall. Removal of the clay layer (B859) exposed a patch of surface which we assumed to be the same as that recovered in our earlier sounding to the north—the latest material from this extension is however, 7th century, thus dating the north-south wall B804 to a period before or during the Archaic rebuilding phase. While the wall B804 is not well preserved, its position along the contour suggests the line of a poorly preserved spine wall or some other substantial Archaic structure, the foundations of which are most likely late 7th c. in date. 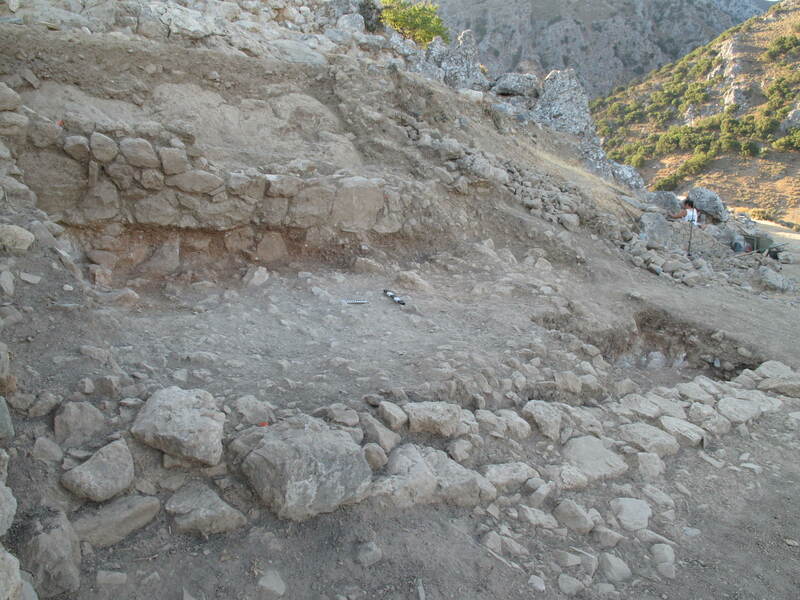 The extension of the sondage on the west side of the wall B804—the space between the east wall of B1500-B700 (B707) and B804—revealed three walls of a Late Minoan IIIC building situated at a lower level, partially obscured by wall B804, and buried by Archaic cobble fill. A segment of the east wall of room B1500 (B707), exposed in 2003, appears to be a double wall, containing cobble fill with LM IIIC pottery on its east side. 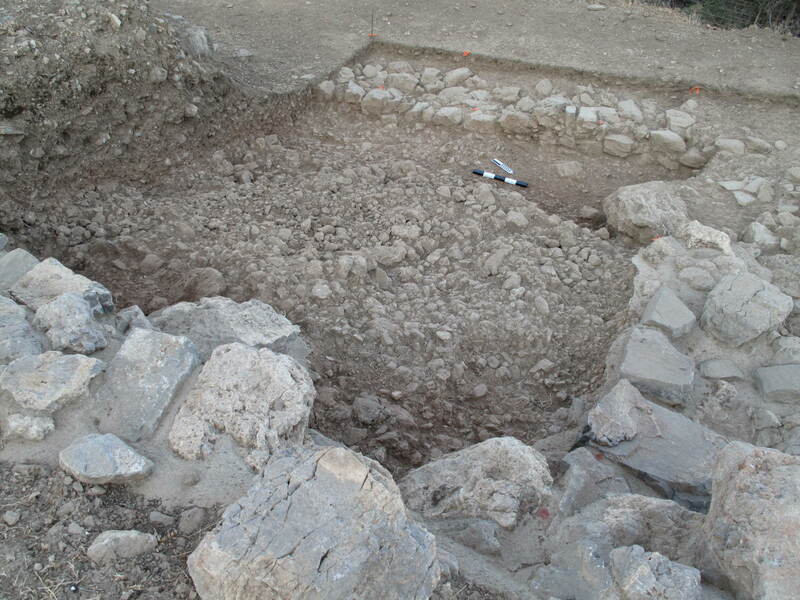 The purpose of excavation in 2013 was to excavate this cobble fill, explore the structure and date of this double wall and its relationship to wall B804 to the east. Excavation exposed a 0.60 m deep layer of cobble fill burying three walls of an LM IIIC building: wall B862 on the east, which lies roughly parallel but below wall B804, forms a corner at its northern end abutting a short east-west wall B866. This north wall B866 extends up to wall B707, appearing to bond to form a northwest corner of the building. The corner is badly damaged because of the Archaic-phase building of room B1500. It appears that the Archaic builders constructed the east wall of B1500 (B707) up against the west face of an earlier wall, destabilizing its structure, but also built directly on top of it from the top level of the cobble fill. Thus the east face of wall B707 (B869), a lateral segment of wall is actually the surviving west wall of the LM IIIC Building. The limits of the building on the south have not been reached, but the excellent preservation of the walls and pre-Archaic stratigraphy suggests the continuation of the building along the terrace in this direction. As excavated the building is four meters long (north-south)—internal dimensions from the south face of wall B866 to the scarp on the south—and 2.0 m wide. On the interior, underneath the deep cobble fill level, a layer of roofing material and wall collapse was exposed sealing a yellow-grey phyllite silt floor surface, which is best preserved across the middle and east side—a channel along the west, against the west wall (B869) appears to be eroded, probably by runoff between the wall and the bedrock ledge. The walls are very well preserved, notwithstanding the drastic modifications of this terrace during the Archaic building phase. The foundations are preserved to about five courses of small to large boulders (ca. 1.20-1.50 m in preserved height; 0.60-0.80 in width). There is a stone platform or stand in the northeast corner—a single large stone with a slight depression, containing a concentration of pebbles; next to it a stone lid; and a concentration of burning and ash on the floor in front of the stand. Traces of burning and ash were also found in the middle of the room. Fragments of an LM IIIC tripod cookpot and cooking tray (baking plate) were found on the floor of the room. The results are important for a number of reasons. First the building is the best preserved LM IIIC structure on the site to date, with unusual preservation of occupation level and destruction debris; second the depth and preservation of the Archaic cobble fill, extending behind walls B862 and B866 (to the north and east), but neatly preserving the northeast corner of the building—and north and east and west walls—suggests either that the structure was exposed into the 7th century, up to the time of the filling of the terrace during the construction of spine walls; or that the Archaic builders excavated down to the building, but chose to leave it mostly intact. The presence of LG and EO material in the cobble fill layer confirms the existence of these phases that were likely destroyed during the reconstruction of the terrace at the end of the 7th century. Third, the walls, tumble, and roofing layers are very well preserved, suggesting that there was no continuing use of the building past the 12th century—though it is possible, but perhaps unlikely, that the Archaic builders excavated the interior of the building before depositing the cobble fill. B3200 and B3400 represent two adjoining Archaic rooms of the Southwest Building—a hall and storeroom—which were excavated in 2005 and 2006. In 2013, we excavated the western baulk of B3200, removing modern stone debris and terrace fill from the western edge of the terrace. While the aim was originally to excavate a narrow sondage at the edge of room, in order to expose the top extant course of the continuation of the western spine wall recovered in B3500, we exposed a pithos-sherd scatter across the middle and north side of the unit—most likely more of the pithos or pithoi recovered in 2005. While the material clearly belongs to the Late Archaic floor of the storeroom, the sherds were found resting below the level of the floor, on loose stone debris, evidently an eroded surface on top of terrace fill. 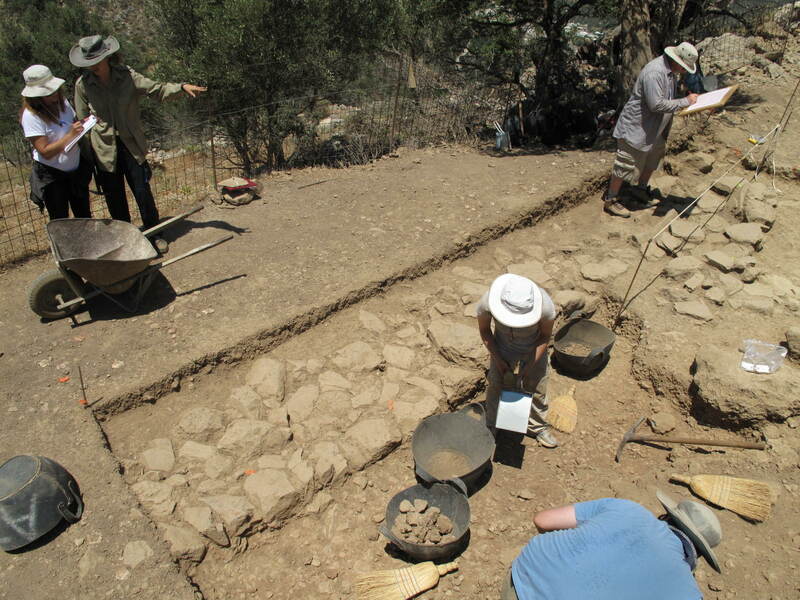 In B3400, we expanded the trench to the west, pulling modern terrace fill and very dense stone debris off the terrace, so we could expand excavation as far to the west as possible. A shallow sondage was excavated (ca. 1.40-2.0 m wide) across the width of the room; while the Archaic floor surface appears to be eroded at this juncture, the same stone tumble and terrace fill that was recovered in B3200, was exposed across the length of the sondage. The dense stone debris does not have the density or consistency of Archaic boulder or cobble fill, and could be wall collapse sliding down the eroded terrace at its western edge. It was decided not to continue excavation in either of these western margins, without first clearing the terrace to the west, removing modern terrace wall, stone heaps, and fill from across the western edge of the Southwest Building. This area will be a target for excavation in 2014. B3500, excavated initially in 2005, is complex stratigraphically. It consists of a Hellenistic (HL) building constructed up against the south Archaic wall of room B3400. The HL structure, with benches and a central hearth, appears to have been built directly on top of LG-EO walls and floors, destroying Archaic levels in efforts to level off the terrace for building. To the south of this Hellensitic construction, a fragmentary spur wall and surface of Archaic date was recovered near the west face of the east spine wall. To the south and west of this wall, no Archaic surface has survived, but the underlying cobble fill packing for the original Archaic building was found across the area of the trench. The goal of work in 2013 was to excavate into the cobble fill to determine the structure of the Archaic terrace, the post quem date for the deposition of the fill, and to explore earlier occupation levels that might be preserved—perhaps a continuation of the LG building to the north. Excavation in 2013 exposed a 1.0-1.30 m deep densely packed and well sorted deposit of cobble fill (B3532-B3533), lying against the deeply bedded east face of the western spine wall (wall B3526). While the fill layer contains material of Late Minoan IIIC, LG and EO, the latest pottery is late 7th century, which we have established as a rough post quem or ad quem date of the major Archaic rebuilding phase at Azoria. This material from B3500 and other foundation levels (such as B800 and A2800) should provide a date for the construction of the system of spine walls, of which B3526, and A2803 and A2806, mentioned above are good examples. In both B3500 and A2800, it is clear that spine walls were set deeply into Early Iron Age levels, most commonly constructed directly on bedrock. The width of the terraces formed by the spine walls in these two trenches is approximately 4.0 m—3.80 m in A2800; 4.20 m in B3500. The depth of cobble fill is similar as well; in B3500 if we project the level of the Archaic floor surface as the bottom of the eastern spine wall (B3504) and spur wall (B3522), the maximum depth of fill originally contained by the western wall B3526 would have been about 1.70 m—1.50 meters was the estimated depth of fill in A2800. The spine wall B3526 is exposed to 4.5 m in length (north-south); preserved to five regular courses (about a meter in height), and uses consistently smallish boulders—more like the west wall of A2800 than the east wall. The similarity in the magnitude and method of construction, the consistent terrace width, and depth of the cobble fill in A2800 and B3500 are indications of urban planning on a large scale. North of the spine wall B3526 we exposed part of a small Hellenistic installation—obscuring the continuation of the spine wall to the north, and intruding on both Archaic and EIA levels. The construction is an unusual curved wall or low bench—one face; and one-two courses—with a curbed hearth on the west side. The architectural context of this bench and hearth installation is not clear—that is, if this were originally interior space; its relationship to HL hearth room to the east. No comprehensible architectural transition was found between these adjoining hearth rooms, though it is possible that both were housed in a single HL building. The baulk along the west side of the main rooms of the Service Building (B1200; B700; and B1500) was excavated in 2013. The goal was to understand the use of this space, the structure and phasing of the west wall of the Service Building (walls B1505; B717, B1211), the patterns of access into the building; and the possibility of the extension of EIA or Final Neolithic occupation out onto this terrace. 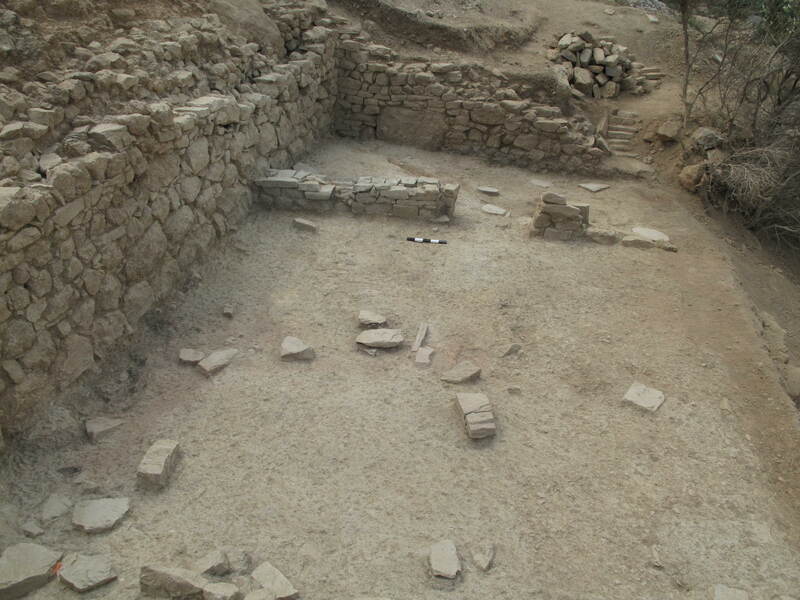 A 0.7-1.20 m deep layer of surface debris, terrace fill, and slope wash was removed in several passes across the length of the terrace, from the courtyard in B3100 in the north, to the excavated area of B1200 in the south. The deposition underneath this fill and silt layer consisted of wall collapse—medium size to large boulder-size stones; these were most dense and high alongside the west side of the Service Building, especially in front of walls B1505 and B1211. This wall collapse layer was concentrated and spread toward the west in front of B1500 and B1200, but a row of tumble was also exposed along the full length of the wall. 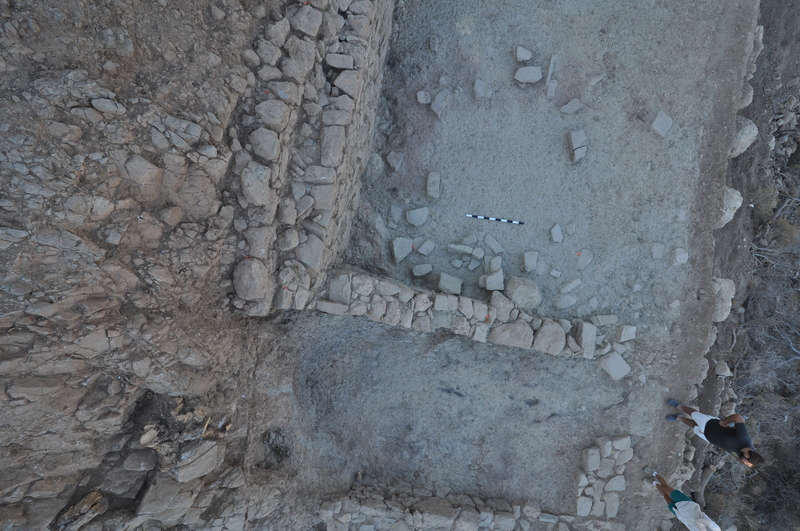 Although the stone debris appears to penetrate to the occupation surface (bottom of B4210), a 20 cm deep layer of roofing material and occupation debris was distinguished from the wall collapse, and exposed across most of the excavated area of the surface. The occupation surface is well preserved across the east and middle areas of the terrace. The western edge, which is supported intermittently by the surviving boulders of the Archaic spine wall, is sharply eroded—with large wall stones slipping down into a gully behind the spine wall, or out to the edge of the terrace, where the spine wall has fallen away. The reconstructed width of this terrace is however substantial—some 4.5 meters from the west face of the Service Building to the inner face of the spine wall—and it remains unclear whether this space was an exterior road (or extension of the courtyard in B3100), or roofed space. The presence of dense wall tumble and roofing material may be explained by the condition of the west wall of the Service building, which was clearly tipped to the west; indeed the best deposits of pottery and food remains are located along the eastern edge near and against the wall—west face of the building had apparently accumulated and preserved occupation debris. We suspect that when the west wall collapsed outward to the west, parts of the roof superstructure most likely tilted and fell into the corridor. The street/occupation surface of B4200 is about 0.7-1.0 meters lower than the Archaic floor level in B1500 and B700, and excavation across its surface exposed the top extant course of three earlier phase wall segments situated perpendicular to the line of the west wall of the Service building—B4212 and B4213 in the north, and B4214 in the south. These walls, running perpendicular to the west wall of the Service Building, and at a lower level probably belong to structures of earlier 7th century or EIA occupation. One goal of work in 2014 is to explore the function and phases of these early walls. The first project at the start of the 2013 season was to remove our excavation dump (2002-2006 seasons), top soil, and modern terrace fill from the area north of B3000/B3900, and west of D300 and D500, downslope of the Monumental Civic Building—an area about 400 square meters in area (20 x 20 m) and soil depth of some three to four meters. This excavation, collected initially as B4000 surface, exposed the broad outlines of the EIA-O building (B4000, B4100, and B4400). The northern and eastern walls of the building were found to have been constructed up against a steeply sloping outcrop of bedrock that extends from the area in between D300 and D500 above, down behind B4000, and alongside the north wall of B4400. While the entire slope of the bedrock was not cleaned in 2013, the exposed surface contains eroded cobble fill—perhaps remnants of built terraces supporting streets that continued along the contours at this juncture—and individual blocks that may be the remains of steps leading up from the streets below and providing access to the Monumental Civic Building and Service Building. At the base (western edge) of this bedrock outcrop is a 9.5 m long wall, built up against the bedrock and conforming to its irregular line—the wall runs about 6.0 meters (northeast-southwest) and then curves south and east until it abuts the north wall of the EIA-O building at its western end. The wall certainly formed the back (east) wall of rooms to the west—yet unexcavated—but it also must have formed the retaining wall for fill supporting the same street that ran north-south with the contour, over the east room of the EIA-O Building and the bedrock outcrop to the north, and then just below and to the west of the terrace of the Monumental Civic Building. We opened a small test trench in front of the wall on the west side in order to determine the extent of deposition, with a view to expanding excavation along this terrace north of B3600 and B4400 in 2014. The trench was about 4 x 4 m square, positioned against the west face of the wall (B4301). 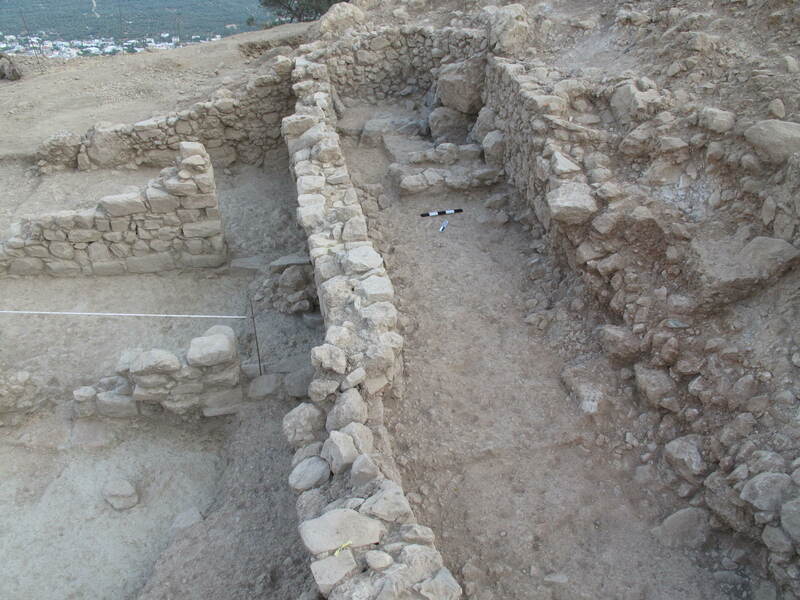 A series of excavation passes (as pails of B4300) removed the remainder of excavation dump and slope wash, exposing the top of roofing material (Late Archaic in date)—the wall at this level is preserved to a maximum height of about 1.20 meters. The trench was closed, as we will need to expand the excavated area to remove the remaining dump debris, and provide greater horizontal resolution. The Northwest building consists of six interconnected rooms. In 2006 we had excavated two rooms in D700—a hall and storeroom. The west room of D700, the hall, has two doorways leading north and south. In 2013, following the doorways, we began excavation in two contiguous trenches, D1500 to the north and D1600 to the south. Excavation in D1500 exposed a single large room, while in D1600 to the south we recovered three interconnecting rooms: from north to south along the terrace, a narrow room or vestibule (D1600-1); a kitchen (D1600-2); and a storeroom (D1600-3). This suite of rooms form a coherent unit, with the north wall of D1500 and the south wall of D1600 defining the limits of the building. All the rooms in the building show similar stratigraphy: a very dense wall collapse layer covering a fairly substantial stratum of roofing material, sometimes penetrated by wall stones, and containing larger artifacts, such as pithoi. The occupation debris on the floors consists of a layer of burned roofing clay, wood elements and artifacts. Floor surfaces show evidence of extensive burning; scars of beam elements, charcoal deposits and actual beam fragments, gray and yellow clay burned red and discolored by ash and eroding charcoal. We had begun work in D1500 in 2006, exposing the spine wall on the east, continuing north from the storeroom of D700. The trench and space of D1500 is divided by a massive boulder wall (D1503), running north-south across the trench from the jog in the north wall of D700 (D704) which accommodates the doorway between east and west rooms of D700. This wall, B1503, is constructed against bedrock and fill, and evidently retained the foundations for a room or corridor to the east. This space (about 2.70 m wide) was found to have been extremely eroded—the spine wall bordering the east side of the space (D705) is a continuation of the back wall of the storeroom in D700; it continues for a distance of 3.5 m north of D704, then appears to have fallen away. In 2006 we had excavated this space, exposing wall D705 and near its base, patches of grey clay and traces of burning which we suspected to have been roofing material. Excavation in 2013, removed the clay, exposing both the bottom of wall D705 and sterile fill and eroded bedrock underneath—indications that whatever room or corridor existed in this space was no longer extant. The area to the west of D1503 was very well preserved. It consists of a single room, nearly seven meters long (north-south) and six meters wide, with well-preserved north, south and east walls. Traces of the spine wall on the west, as along the rest of the terrace, were preserved below the level of the occupation surface. The stratigraphy consisted of a dense layer of large boulder wall collapse, sealing layers of roofing material and occupation debris. The floor and roofing debris were extremely burnt; evidence is wide spread throughout the room, with indications on the walls as well, where the limestone boulders have fractured, the surface layers of the stones breaking away from exposure to the heat. Elongated pieces of carbonized wood and beam impressions were found on the floor. Scars of charcoal and discolored clay indicate the location of fallen roof beams across the east side of the room; and there are four beam elements north and east of the doorway in the southeast area of the room. There were few features: door sockets next to east and west jambs on the north side of the doorway into the hall in D700 indicate a double door—so far unparalleled on the site. And two pot stands were found about 60 cm north of the south end of wall D1503. On or above the floor, there were a few stone tools; pumice fragments; an unusual concentration of spindle whorls; and a marble perirrhanterion, with large pieces of the base in the middle of the east side of the room, and fragments of the bowl in the northeast corner. Although the room shows the same pattern of burned destruction as found in Late Archaic abandonment levels in the rest of the building and throughout the site, it seems that at some point before the room’s final destruction, three large boulders were rolled into the doorway on top of a layer of rocky fill, probably in efforts to block the door from D700 into D1500. The blocking looks intentional, but it is not regular, careful or complete—looking sort of make-shift. There also appears to be a rebuilt wall within an earlier phase doorway in the north wall near the northeast corner. Preliminary analysis of the pottery demonstrates a 6th century date for material on the floor at the time of destruction, perhaps confirming that the space had been closed off before the Late Archaic abandonment phase. South of D700 and accessible via a doorway in the south wall of the hall was a long narrow room, D1600-1 (fig 6). The room is about 2.5-2.70 m wide and 6-7 m long east-west. A one-course high paved platform sits against the north wall (1.5 m long x 0.80 m wide) on the western end of the room near the doorway from D700. For the east wall, builders seem to have used the modified bedrock. The wall includes a rock-cut bin or shelf cut into the bedrock face about 0.70 m above the floor—50 cm deep; 50 cm high; and 60-70 cm wide. The floor of the room was largely clean of contents except for a complete fenestrated terracotta krater stand centered in the east half of the room; and a scuttle from the room’s east end. As in D1500, burning was extensive across the space. D1600-2 (fig. 7) is the adjoining room to the south of D1600-1. The room is 6.50 long (north-south) and between 6.5 and 7 meters wide. Dense wall collapse and phyllite roofing clay covered the earthen floor which was also burnt throughout, with heaviest concentrations in the north half of the room, especially in the northeast corner and along the east side in the vicinity of several (about 10) stone pithos stands. A rise in the bedrock in the northeast corner has evidently been worked flat to form another stand. Another six pithos stands are located in the northwest area of the room, where there are is also evidence of burning on the floor. Features include a curbed hearth in the center of the room—between two stone-slab post supports; a stone-built (curbed) bin against the north wall, abutting an outcrop of bedrock that was evidently worked to form a table or work platform. On the whole it appears as if pithos storage was concentrated in the north half of the room—the general area north of the hearth. Some 10 stone tools and implements were found on the floor of the room. A miniature shield boss was found on the floor near the east wall, and a fragmentary fenestrated terracotta krater stand was in the southeast area of the room. The southern room of the Northwest Building (fig.7), D1600-3, is adjacent to D1600-2 and connected to it by a doorway, with a single pivot stone on the south side of the doorway next to the west jamb. The room is a storeroom—2.90 to 3.0 m wide and 6.0 meters long (east-west) with a neat row of five pithos stands (stone slabs), regularly spaced along the north side of the room, with two others along the south wall in the southwest corner of the room. An eighth stand, possible a post support, is in the middle of the room. The pithos stands are worked slabs of schist, about 35-50 cm in dimensions. Some have carefully hammered edges to form oval or trapezoidal shapes. The stands are more regular than those in neighboring D1600-2, and were clearly designed to hold a single jar. Each is set out from the wall about 20-40 cm. The floor is uneven, sloping downward from east to west where it appears that the walls, surface and floor contents have slipped, drastically—the difference in elevation between the floor surface on the east to the western edge of the room is some 0.40 m.
The assemblage, though not yet studied, had a number of vessels. While there are fine cups and other shapes, there were a number of pithoi found fallen and broken across the entire surface of the room, with locations suggesting that they were situated on their bases at the time of destruction of the room. There are a number of unusual vessels, perhaps for special or industrial functions—cylindrical bases with spouts. Other finds include a quern and grinder, and a large piece of lead (ingot). All of the rooms of the Northwest Building are interconnected by doorways, with no evidence of access from north or south in the abandonment phase, indicating that the main entrance to the building must have been from the terrace along the west, where only the foundations of the spine wall survive—below the floor level of the building. Given the eroded slope along the west—the floor surfaces break off about 0.80 m from the edge of the west spine wall—we have not been able to determine the point of access from the west. In an early phase (6th century), it is likely that there was an entrance into D1500 in the northeast corner of the room. Archaic houses at Azoria are characteristically large in size with considerable space allocated for pithos and amphora storage; and normally the main hall of the house is directly connected to a single storeroom, but separated from the kitchen by a courtyard, corridor or hallway. Given that criteria, the Northwest Building seems generally similar: the house is somewhat larger than the Northeast building, and the kitchen (D1600-2) is separated from the hall in D700 by a transitional space or vestibule (D1600-1), and the storeroom in D700 is directly connected to the hall. That said, the Northwest Building shows some differences in organization and elaboration of architecture and space: it has two large adjoining halls (D1500, and D700 west), two storerooms (D700 east; D1600-3), an internal vestibule or hallway (D1600-1), and an exceptionally large square kitchen (6.3 x 6.0 m), about 38 square meters in area (D1600-2), accommodating significant storage space—some 16-20 stone pot stands which were most likely used to support pithoi, though probably not at the same time, given their spacing as discovered. Burning in the north half of D1600-2, north of the hearth corresponds to the placement of pithoi. At least four pithoi were recovered in the east room of D700 in 2006, and stands for another eight pithoi were found spaced along the side of the north and south walls of D1600-3. Thus the building itself probably accommodated some 20-30 pithoi of various sizes north of the curbed hearth. 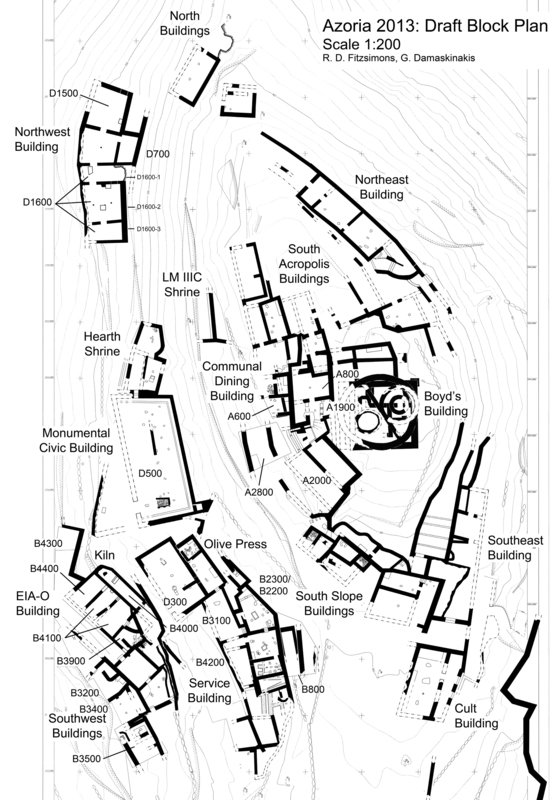 While this volume may not be significantly greater than capabilities of houses—within the North Acropolis Building or the Northeast Building— the number of rooms, space allocation, and organization is distinctly different from known houses, displaying a degree of architectural elaboration not yet encountered in spaces where we have attribute domestic functions. The kitchen’s (D1600-2) size, central position, and lack of adjoining courtyard space are interesting features, as is the direct connection to the storeroom in D1600-3, which is rare on the site—the direct connection between storeroom and kitchen, and the volume of storage in D1600-2, is more like the arrangement in the Service Building. The hallway or vestibule is also interesting (D1600-1). It provides an obvious transition between the halls (D700 west; D1500) and the service or food processing area of the building. Since we do not know the precise location of the access into the building from exterior space, we cannot reconstruct with certainty dendritic communication patterns through this space. Whether or not access was mediated through this room, it provides an obvious transition between food processing and consumption. In terms of degree of accessibility, the adjoining hall, D700 west, with its adjacent storeroom might be considered more public, and the D1500 hall more private or exclusive. Of course the foregoing discussion assumes a domestic function for this space, which is not at all yet certain. The double halls, multiple storage facilities, and integrated food processing room, and artifacts, are probably unusual for houses at Azoria, though granted, our sample of domestic space is not sufficiently large to establish an exclusive or standard pattern. Some variation and degrees of complexity should be expected. That said, the architectural elaboration—large boulders for both east and west walls; the double door entrance into D 1500; the paved stand or platform in D1600-1 are unparalleled. The assemblages recovered are also not what we would expect for domestic space, though again our basis for establishing general patterns for houses remains undeveloped. The imported marble louterion or perirrhanterion in D1500, while probably not unusual in later documented domestic settings in classical contexts, is unparalleled on the site, and has clear ritual implications as well as practical functions. Given its size, likely Parian or Attic origin, and degree of elaboration, it is hard to see it as a component of a regular domestic assemblage. A miniature bronze shield boss—a votive object—was found in D1600-2. The only other shield boss surviving from excavated areas at the site is the A1600 kitchen of the Communal Dining Building. 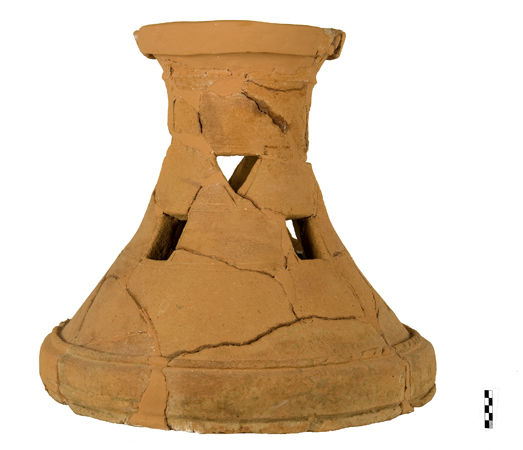 The complete terracotta krater stand centered in the room in D1600-1, along with the paved platform on the west side of the room, immediately west of the doorway, could suggest some special or ceremonial function. Another krater stand was recovered in the southwest corner of D1600-2. Krater stands are of course most numerous in the Communal Dining Building, with concentrations on the upper level which has the dining rooms (A2000; A800) and altar room and vestibule (A1900). There was also a large terracotta stand in a kitchen (B2200/2300) of the Service Building. Although we have found stands occasionally in houses (Southwest Buildings (B3600); North Buildings (D800)), it may be important to note that the two best preserved, studied, and reasonably certain domestic contexts on the site, the North Acropolis Building and the Northeast Building, did not produce any terracotta stands. The pottery from the building has not yet been studied, but at the time of this report we can say that the Northwest Building had two adjoining halls, with drinking and serving equipment—perhaps an inner and outer hall. In the original plan, the building may have been accessible from the north, directly into the north hall (D1500). Eventually it seems that this room and access was closed off, though the building’s entrance in any phase is likely to have been from the west and is not preserved. Eventually the building had a single hall (D700 west), vestibule or hallway (D1600-1), kitchen (D1600-2), and two storerooms (D700 east and D1600-3). If a house, it is certainly the largest and most elaborate so far excavated. The complexity and elaboration would suggest an elite household, with considerable storage and food processing capacities, looking more like the service complexes of the civic buildings to the south. The Northwest Building challenges our regular conceptualization of domestic and civic spaces, perhaps blurring the boundaries of these reductive categories. In this context, it might be better to visualize a single large household here—as we have suggested before, the center of a larger kinship corporate group of which the urban house was the principal locus of mobilization and storage of produce for redistribution, payments to civic institutions, and private, as well as public consumption. If we see the space as domestic, it is decidedly different from the Northeast and North Acropolis Buildings. 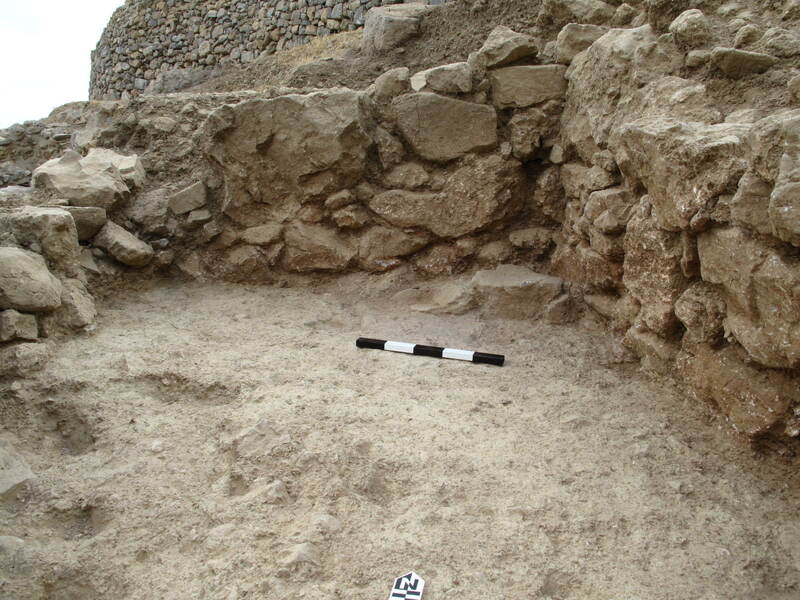 Excavation was conducted contiguous to and north of B3000 and B3900 where, in 2006, we had discovered the south façade of two rooms of a building (EIA-O Building) that appeared to extend northward under a modern agricultural terrace, terrace fill and stone pile, and our excavation dump. After removing the dump, stone pile, and terrace fill, we exposed the basic plan of the building. It consists of five rooms: (1) B3900, the south or front room (prothalamos) which we partially explored in 2006; in the 7th century this room was shortened along the its east side by a diagonal wall, and a stair was inserted in the room’s southeast corner, providing access to a raised courtyard space providing access to the room in B4000. (2-3) B4100, the main room, which consisted of a single hall with a central hearth in its earlier phase (LG), and then subdivided into two rooms in its later phase (EO); (4) B4400, the back or northern room of the building is connected to B4100 through a doorway; and (5) B4000, an elongated room, apparently added to the building in the 7th century, accessible through a doorway and courtyard at its southern end. The northern end of the room in B4000 has a pottery kiln. Soundings conducted in 2006 in B3900 and B3000 demonstrated Late Geometric and Early Orientalizing phases for the structure, which appears to have been buried by a street in the Archaic period. Work in 2013 confirmed our basic ideas of the sequence of building, with some modification. We excavated a sounding beneath the Archaic floor surface of this room in 2013. 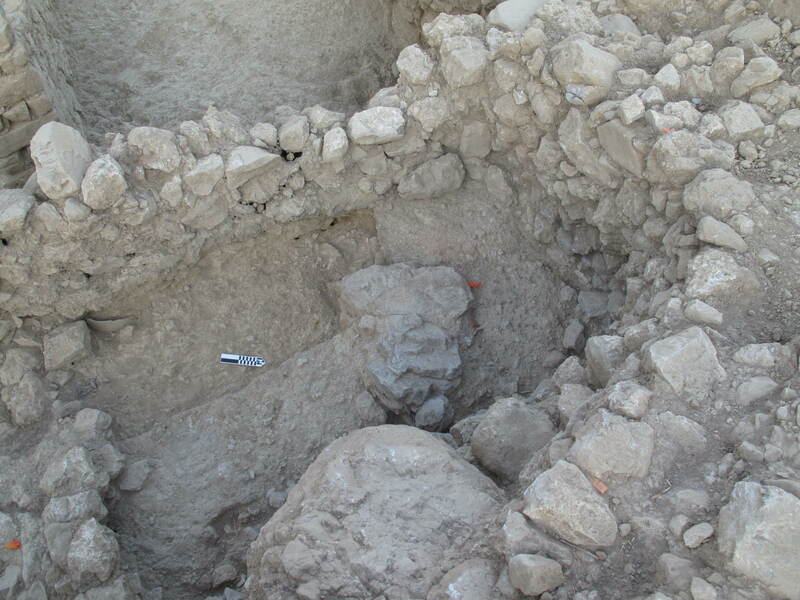 Excavation in 2006, east of the Archaic curved wall (B3910), exposed a series of earlier floors or surfaces of EO, LG, and earlier date (LM IIIC post quem). 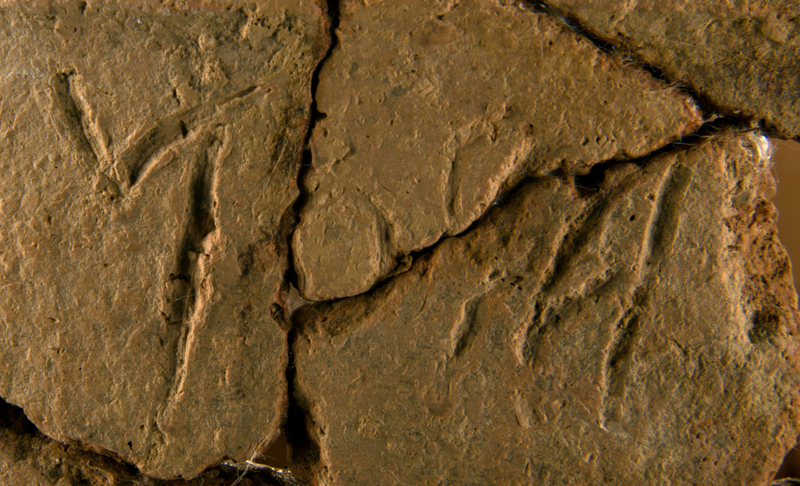 The earliest level reached was about 20-25 cm below the level of the preserved Archaic floor surface in B3900. Furthermore, a sounding beneath the EO surface of the courtyard in B3000—against the outer southeast corner of B4100—indicated considerable depth to this foundation, over 1.5 meters below the EO ground surface—though that level reached was nearly the same level as the Archaic floor in B3900. The sounding in B3900 revealed the foundation of the walls below this level, including what appear to be earlier wall blocks in the southwest corner and underlying the south and west walls. The test did not however recover earlier floor surfaces of the room, as we had hoped, but gravel fill and eroded bedrock. Although, as mentioned above, these surfaces are well preserved in the adjacent space of the room in front of the doorway into B4100 (between the Archaic curved wall, B3910, and the diagonal EO wall, B3051), it appears that the Archaic builders excavated through the earlier levels, destroying the surfaces, in order to bed the Archaic floor surface at a lower level— though they evidently kept the earlier walls in situ. The Archaic floor surface of B3900 is about 20 cm below the level of the preserved EO surface east of wall B3910. We expected however to recover the LG surface at about 10 cm below the level of the Archaic floor. We did find that the north wall of B3900 (south wall of B4100) and the west wall of B3900 are bedded some 20-40 cm below the LG level. Thus the floor levels of B3900 that are contemporary with the phases of use of the EIA-O building (B4100, B4400, and B4000) are preserved only in the small space south of the doorway between B3900 and B4100. The main room (called in earlier reports the North Room of the EIA-O Building) is connected to the south room (B3900) via a well-built doorway in the center of the diving wall. Three different floor surfaces were found in the sounding east of the Archaic screen wall in B3900 (B3910), which effectively narrows the space of B3900 on the west and south, and blocked off the entrance to the building’s main room (B4100). In its last 7th century use phase, the room was entered by means of a short stair and raised threshold through this doorway. The so-called North Room, which is the central or main structure of the EIA-O building, is ca. 10 meters long and over six meters wide internal dimensions. It was found to have been subdivided into two rooms in its earliest phase (B4100 on the south and B4400 on the north), and three rooms in its latest phase in the 7th century. The north wall of the northernmost room, B4400, was built up against the outcrop of bedrock that protrudes from the east, sloping down from the terrace of the Monumental Civic Building. The broad outlines of the rooms were defined after the removal of terrace fill, slope wash and our excavation dump (B4000 surface). The ancient deposition was about 1.7 meters deep along the east wall of the room, becoming more shallow, compressed, mixed and contaminated in the western edge where the slope erodes essentially to the level of the modern ground surface. 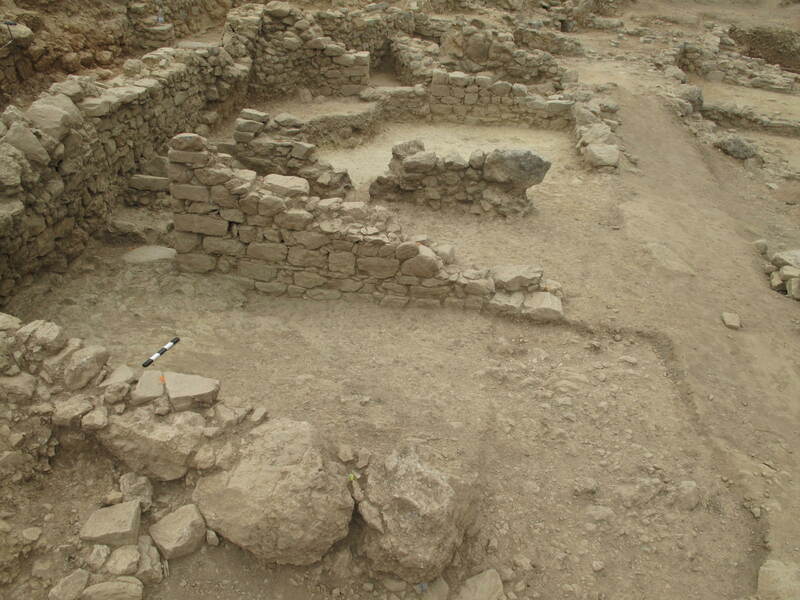 The area excavated as B4100 consists of the main room of the building, divided into two rooms in its later phase. The stratigraphy of the space was complex. A deep layer of stone debris and very dark soil with a large amount of pottery and animal bones covered most of the area of B4100—with stone debris (probably wall collapse) concentrated in the north side and northeast corner and extending across B4400 to the north. This dark soil and stone debris was removed in several pails (B4103). While the large stone debris was found throughout, the level of dark soil becomes more distinctive in pail B4103.10 and following. 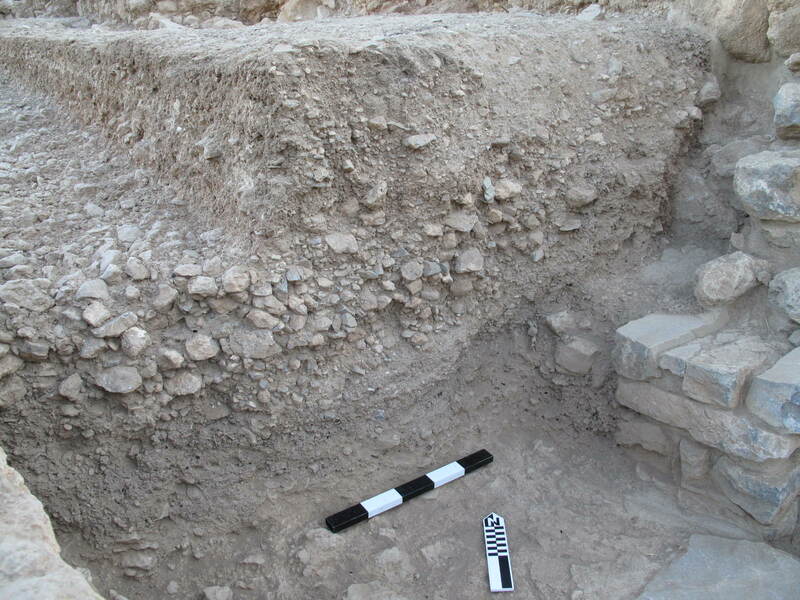 This material appears to be an Archaic dump, perhaps accumulating over a long period of time while the adjacent terrace to the east (B4000) had a street that ran along the contour above the building. Below this dump or fill layer, we discovered the top of the later phase dividing wall (B4109; B4116), and a remarkably uniform layer of cobbles, about 30 cm deep (B4105)—in size, shape, and distribution, looking very much like the Archaic cobble fill normally exposed in foundation deposits across the site. This material extended across the full extent of the space of the trench. The cobble fill also forms the foundation for a small buttressing wall or screen wall, B4104, in the southeast corner of the room, evidently constructed to support the south segment of the room’s east wall (B3050), which had at some point slipped to the west, bowing perhaps under the weight of the fill and packing for the street in B4000 on the east. It appears as if the layer of cobble fill was originally deposited as part of a filling episode, perhaps for the foundations of an Archaic building, but then abandoned, and left exposed to collect the dumped debris of B4103. Below this cobble layer, a 10-20 cm stratum of occupation debris was recovered across a narrow patch of consolidated clay surface in the eastern side of the room, extending from in front of the threshold blocks and doorway into B3900 in the south, along the eastern side of the room—this material was excavated as B4108.1-2 and B4114 in the southern (southeastern) area of the trench (south room). The floor surface is extant for some 2 meters on the south (in the southeast corner of the room, narrowing to about one meter from the east wall, where a well-built threshold block marks the doorway and transition into the north room of B4100. The surface does not survive into the center or western areas of the room on the south, where a layer of floor packing/cobble and boulder stone fill (B4113) was exposed across the full extent of the southern room. This surface runs up to a threshold and doorway, where wall segment B4109 forms a well-built jamb for a door into the north room of B4100. Wall B4109, and the west extension (wall B4116) were constructed with this surface. The steps in the doorway lead down to a slightly (10 cm) lower surface in the northern room, which was well preserved only to about a meter out from the east wall. The material on top of this surface (B4117.1-3) was a distinct layer of slumped roofing material, covering the lower steps and surface, and containing evidence of burning (charcoal, and burnt clay). While the floor surface was preserved (clearly consolidated) along the east wall and in front of the doorway, the material to the west—essentially the stratigraphic equivalent of B4117—was evidently occupation debris as well: wall blocks were discovered in this excavation, but also evidence of burning, especially against the north face of wall B4109. A small hearth-like installation—two upright slabs of stone with flat schist stones forming a floor, and a possible curbstone on the west—was constructed against the east wall of the north room (B4122); it was exposed at the bottom of the cobble fill layer (B4105), and clearly constructed on top of occupation debris (B4117; B4107) of the later floor surface. The function and date of this stone-built installation are not certain; it has no associated occupation surface. The material exposed underneath the floor level—B4112 in the north; and B4115 in the south—consist of a deep stratum of floor packing (B4115.1-5) and dense stone debris and roofing clay (B4112.1-6; B4115.6-9). This deep stratum (ca. 30 cm) consists largely of roofing material and wall stone debris lying directly on a phyllite clay floor surface, representing the earliest floor so far recovered in the building. The floor is remarkably even, and though there are patches of burning, they probably represent remnants of cooking activities. The floor extents across the entire area of the room—underlying the later cross-wall segments (B4109 and B4116)—though it is best preserved in the south. In the center of the room was a hearth of burned clay, roughly rectangular in dimensions (ca. 1.0 x 0.5 m), and partially obscured by the later wall B4109/B4116. To the southeast of the hearth is a stone post support. The earlier-phase room was nearly square in shape, 6.50 m long (north-south, interior dimensions) and 6.0 m wide (east west), with the hearth centered in the east-west axis, about 3.80 m from the south wall, so slightly north of center on the north-south axis. Almost 40 square meters in area, the room was substantial, with well fashioned doorways leading south into B3900, which was evidently the front room of the building; and north through a well-built doorway into B4400. B4400 is the north room of the EIA-O building, apparently used continuously through the two major phases of occupation with little significant change in floor level. Though B4100 and B4400 are connected spaces, the deposition was different. The upper stratigraphy consisted of wall tumble, mixed with large cobble fill, spilling out from the north end of B4000 across and over the tipped wall B3050 (B4401, B4403). Underneath this surface material a deep and densely packed layer of stone tumble, certainly a significant phase of wall collapse, was excavated (B4404); the material, some 50-70 cm deep, was concentrated in the east half of the room, against the east and north walls, extending into the doorway on the southeast. Another layer of stone tumble (about 20-30 cm deep), fairly evenly distributed across the room was excavated under B4405, as B4406; this rested on a fairly shallow layer of roofing clay and occupation debris that covered nearly the entire extant floor surface of the room (excavated as B4409.1-2). Though the floor is eroded on the western edge—the material collected here was excavated as B4407—the east half of the room may preserve either a deeper buildup of floor surfaces, or it might rise slightly in this area. The floor as preserved extends across the central and eastern part of the room, up to the doorway in the southeast corner, where there is a worn threshold block of schist even with the floor level. The transition to the upper (later) surface in the north room of B4100 and this threshold is a poorly built step—a line of four stones retaining the packing for the upper floor in B4100. The room is 2.70 m wide (north-south), and extant to some 5.0 m east-west. The doorway between B4100 and B4400 is about 1 meter wide. The absence of a stratigraphically distinctive floor surface, at the level of the later floor in B4100, along with the stepped transition through the doorway, suggests that the room’s floor continued in use, with some evident resurfacing through the various periods of occupation suggested by the stratigraphy in B4100. The function of this room is not certain. Like the surfaces in B4100, there were considerable amounts of pottery in the occupation phase strata, but no in-situ assemblages. B 4000 consists of a long room bordering the entire east side of B4100/B4400. It represents a modification of the EIA-O building in 7th century. In this phase, the south room (1) in B3900 was truncated, its southeast corner removed, and a diagonal wall, B3051, put in its place, narrowing the space of B3900, but expanding the area on the east side. Here the ground level was raised and a wall and threshold were built, providing access to the oblong room B4000. On the west side, in B3900, the floor level was also raised up to a stepped threshold into the south room of B4100. B4000 is 9.20 m long (north-south), and about 1.80-2.0 meters wide, with the room widening slightly at its southern end. The space of the room narrows at its northern end (to about 1.5 meters) which was the chamber of a potter’s kiln (figs. 10-11). The kiln occupies about 3.5 m of the northern end—the exterior wall of the kiln is on the south, marked by a stepped access: a low platform (ca. 1.30 m long, 50 cm wide) rising to another row of stones forming a single step along its north side. This transition is about 5.80 m north of the south wall of the room. The west wall of the room is the east wall of B4100/B4400 (wall B3050); the east wall, built against and upon the bedrock, is the 7th c. wall B4004. The stratigraphy of the room is complex and important in evaluating and dating the transition from Early Orientalizing to Archaic periods. In the 6th and early 5th centuries, the entire area of B4000 was covered by a street running along the contour of the southwest slope above the Southwest Buildings (fig. 10. We originally exposed part of this street in the adjacent trench to the south, B3000. We continued excavation to the north is efforts to expose the full extent of the street surface running below D300. Excavation in B4002 (.1, 2, and 5) exposed the upper surface of the street, which is best preserved along the east, sloping, and perhaps eroding out along the west (B4002.4). Removal of this latest street surface, and packing or resurfacing level (B4008, B4011) exposed an earlier street level, and deep stratum of clay packing underneath (B4009.1-3; B4012). While we had not recognized two layers of street surface in our sounding in B3000 in 2006, there seems to be at least two episodes of street construction (about 10 cm deep), supported by a 20-30 cm-deep level of clay fill. Underlying the packing level, was a 30 cm deep layer of Archaic cobble fill, probably originally contained by wall B3050 on the east, but as excavated, spilling over the top extant course of the wall. It is my assumption at this point that the construction of the street—the deposition of cobble fill and clay packing—should have coincided with the shoring up of the southeast corner of B4100, that is the deposition of a thin layer of cobble fill in B4100, and the construction of the small curved buttressing wall in the corner formed by walls B3050 and B3904. The strata underlying the cobble fill consists of the abandonment phase deposition within the 7th century room. Underlying the cobble layer was a fairly even deposit of yellow phyllite clay removed across the south part of the room in two horizontal passes (B4014.1-2; and B4014.4-5)—this material may constitute the uppermost surviving layers of roofing material and occupation debris from the room. B4014.6-7 consists of a deeper layer of the same material, probably roofing material and wall collapse, mixed with localized deposits of burned material (B4015.1 and 2). B4017 consists of occupation debris lying directly on top of the floor surface of the room across the middle and southern areas. 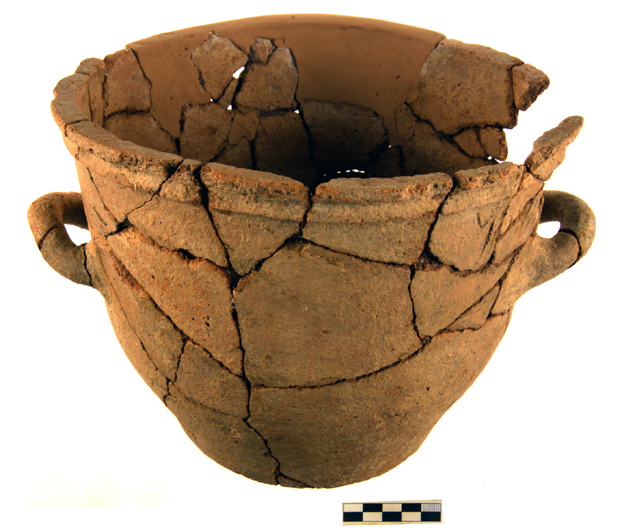 A number of whole vessels were recovered along the east side of the room—including a small cookpot, short necked cups, a hydria, an aryballos, and a coarse plain krater with an inscription ([-aron) inscribed before firing, in sinistrograde. The stratigraphy of the area over the kiln, in the north part of the room is a bit different. While the street continued over this area, stepping up slightly with a single course step in the street, the cobble fill consisted of densely packed large cobbles and small boulders (B4013), overlying a thick layer of greenish gray phyllite clay (B4016)—similar in consistency to roofing material, but possibly a packing layer for the cobble fill. This may be the same material as the even clay layer to the south (B4014), perhaps a leveling fill raked across the area for bedding the cobble fill. The space below B4016 is within the stoking chamber (fig. 11)—that is below the floor level of the kiln. This material was a mixture of ash and ashy soil (B4018) and burned soil (B4020) mixed with phyllite silt at the bottom (B4021), which may be the bottom of the stoking chamber. The kiln’s floor and clay lining are not preserved, though small patches of red clay are visible below the step (B4022), on the lower east wall, and adhering to the central pillar or post (B4023), east wall and north wall (B4005). The foundation of the central post or pedestal consists of two boulders, standing about 0.5 m high, though the floor of the stoking chamber (or the bottom of the pedestalled) had not been exposed in 2013. The entrance to the kiln is marked by a low stepped wall, extending out from the room’s east wall about 1.30 m, and leaving a 0.70 m aperture into the stoking chamber. The kiln’s north and east walls are extant to a height of about 1.5 m. The east wall of B4000 (B4004) forms a well-constructed face along the middle and north segments, though a change of construction is visible at the kiln’s entrance or southern wall which is marked by the stepped wall (B4022) which is probably the entrance up to the door of the chamber. About a half meter north of the stepped entrance, the east wall abuts two large boulders, apparently stacked, and protruding into the space of the kiln. The wall’s even coursing is discontinued at this juncture—the continuation of wall B4004 north of this point forms a distinctive curve around the back of the building and extending along the north (B4005). This northern end—essentially the wall of the firing chamber—is a curved façade of irregularly laid small boulders and large cobbles. The wall appears to have been constructed against and partially on top of the back wall of the EIA-O building—the continuation of wall B4402 from the west. The west wall of the kiln is the northern segment of B3050—the east wall of rooms B4100 and B4400. The construction method for this segement—essentially north of the doorway between B4100 and B4400—is very different from the rest of the wall. Regular courses of dolomite boulders alternating with narrow string courses of schist and sideropetra form the west face of B3050 along the interior of B4100. North of the doorway—essentially on line with the entrance to the kiln on the east side of the wall—the fabric of the wall consists of rough and uneven courses of large rounded dolomite boulders, with numerous smaller, cobble-size, stones fitted into the interstices. It is likely that this part of the wall may have had to have been rebuilt periodically as part of the repeated building of the kiln wall. The stones lining the stoking chamber, and the walls of the firing chamber are burned, in some cases calcined or completely burned, and a black and gray powdery ash stained the walls of the stoking chamber from the reconstructed level of the floor. Though the floor of the kiln is not extant, fragments were found within the stoking chamber. Its position can be estimated by the line of ash, which corresponds to the top of the step at the entrance, and the bottom of the cobble fill level (B4013). Fragments of both wasters and pise lining of the walls and floor have been recovered from the stoking chamber and adjacent contexts. Analysis concentrated on samples from D1600 and to a lesser extent D1500. The samples from these rooms contain considerable quantities of wood charcoal–as we would expect given the evidence for heavy burning. Food plant remains are disappointingly sparse. The first and second rooms of D1600 (counting from the north) produced small quantities of grape and olive as well as a few pulse seeds and a single fig seed. The olive fragments tend to be large (suggesting they derive from stored olives not press cake). In the northern end of the second room there are traces of skin/fruit and stem associated with whole grape pips. The third room (with the pithos stands) produced only a couple of grape seeds. There are still light fractions from this room to analyze, but we are not optimistic that they will differ in content from the samples examined to date. D1500 produced the usual grape and olive as well as a single fragment of grain (we analyzed fewer light fractions from this room). If anything, the quantities of seeds may be slightly higher in this room than in the D1600 rooms. It is worth noting that the assemblage from D700 (especially the eastern storeroom) contained a larger and more varied assemblage of seeds than did either D1500 or D1600—the D700 assemblages includes reasonable quantities of grapes and olive as well as smaller numbers of grains and pulses. We also worked on samples from the floor deposits in B4100 and B800 (all heavy fractions from these floors have been examined but only a handful of the light fractions have been sorted). The B4100 samples contain the usual grape and olive but also a low but consistent presence of grain fragments. B800 produced olive, grape, almond and a trace of pulse. In consultation with Cleo Zervaki, conservator of the 24th Ephorate of Prehistoric and Classical Antiquities, and Dr. Stephania Chlouveraki, Director of the W.D.E. Coulson Laboratory (INSTAP-SCEC), architectural conservation was conducted in two areas of the site (Northwest Building and EIA-O Building) where the condition of walls required immediate consolidation because of the risk of collapse during the year—winter rain and weather conditions at this altitude; the natural erosive action on the site given the slope and weathering patterns; seismic activity; and the potential for human and animal traffic necessitated emergent field conservation. Conservation was directed on site by Chlouveraki. Full-scale conservation of all walls and built features exposed in 2013 will be conducted along with excavation during the 2014 season. 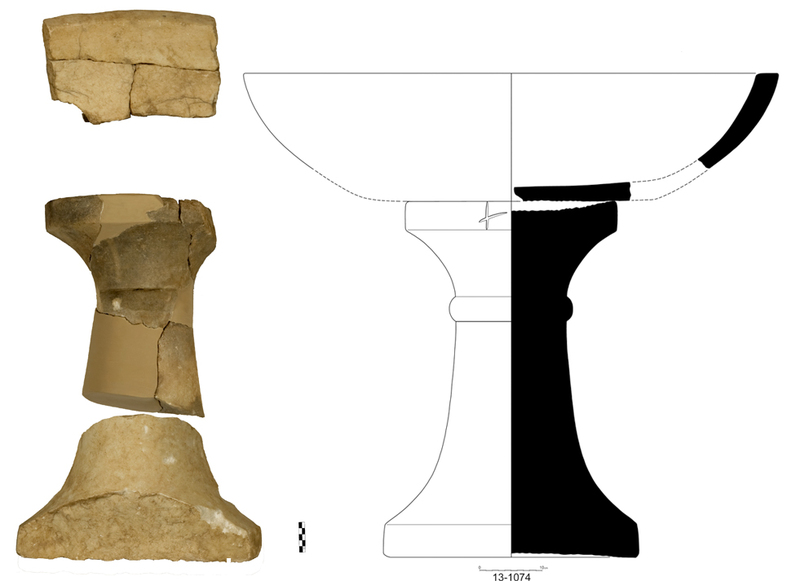 The north and south segments of the east wall of B4100/B4400 (wall B3050)—dividing rooms and stratigraphic units B4100/B4400 and B4000—were conserved using materials and methods described in our application for wall conservation submitted with this excavation permit request. The upper courses of these two wall segments had tipped to the west under the weight of a deep cobble leveling fill used as a foundation for an Archaic street in B4000 to the east. The southeast corner of D1600 (D1621) and the top courses of the south segment of the double east wall of D1600 (D1602; D1608), were also conserved in 2013. These walls were stable as recovered, but extreme weathering from the drainage on the bedrock slope above and to the east of these walls, had dissolved much of the earth mortar, destabilizing their structure and increasing the risk of movement or collapse under normal weathering conditions. Additionally, we experimented with two methods of earthen floor consolidation—in the north half of B2200/B2300; and in the northeast corner of D300. In both instances we selected areas where the slope and bedrock terrain were such that the clay floor (phyllite silt) had been destabilized or eroded by weathering agents, or had completely eroded away because of the drainage on the slope.